"What will tomorrow’s ag workers and farmers look like?" To fill the shortage, TerraSentia will roll through entire fields underneath the crop canopy taking videos for computer analysis to determine recommendations for fertilizers, pesticides, and herbicides. "8 AgTech Startups Worth Watching in 2019"
Successful Farming Magazine has named EarthSense on their “8 AgTech Startups Worth Watching in 2019“ list. Future Farming magazine and AgFunder today named EarthSense on their list of 12 AgTech Startups to Watch. Premier technology news website Ars Technica has featured TerraSentia in a photo feature about the ARPA-E Energy Innovation Summit. 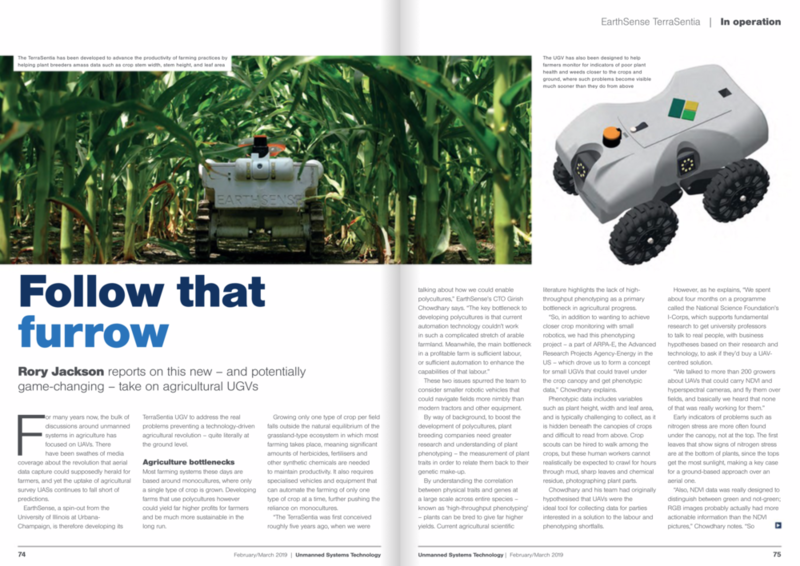 "Growers May Soon be Able to Send Out Ag Robots to Scout Fields"
Photo by Brian Stauffer, University of Illinois. "Robot Gathers Data Under Crop Canopy"
Earthsense’s TerraSentia gets down to the ground level when it comes to collecting field data information. This new and simple technology was developed at the University of Illinois.